A few days ago, I got a message from a fellow vegan asking if I'd ever checked out La Cosecha, the restaurant at downtown's Cesar Chavez Plaza. I had not, so I made a point of heading over there for lunch on Friday. Thanks for the suggestion, Kathryn! 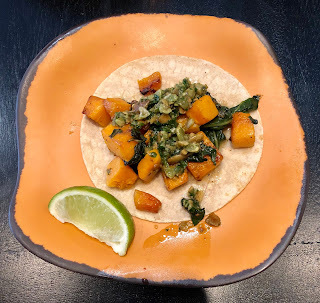 Aside from the chips and salsa or guacamole (which is vegan if you have them leave off the cotija), there was only one vegan option on the lunch menu, but it was a good one -- tacos de papa. This plate comes with three tacos, corn tortillas filled with Yukon potatoes, poblano sofrito, pickled onion, and radish. 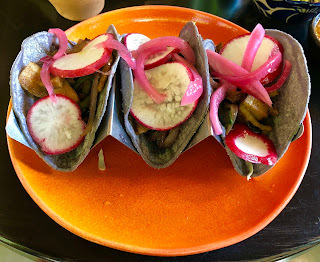 There is a non-vegan version of these tacos, so make sure to let the staff know that you want your tacos made vegan. They were really good, and even better when I added in a little of the salsa and guacamole that I ordered with my chips! 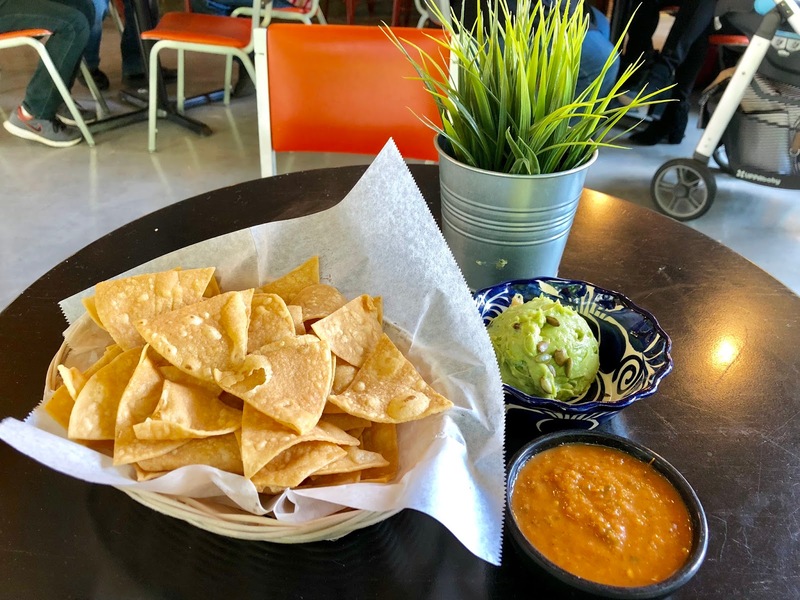 La Cosecha has a couple of other vegan items listed on their brunch and dinner menus. For brunch, they offer tostada de Cosecha, two tostadas topped with beans, avocado, habanero salsa, jicama slaw, pickled onions, and tomatoes. In addition to the tacos de papa, the dinner menu also offers enchiladas de calabacita, three enchiladas filled with sautéed squash, zucchini, and corn. La Cosecha is located at 917 Ninth Street, and their phone number is 916-970-5354. Their website address is http://lacosechasacramento.com/, and their Facebook page can be found at https://www.facebook.com/La-Cosecha-Sacramento-170337176671609/. The restaurant is open Monday through Thursday from 10:00 a.m. to 9:00 p.m., Thursday and Friday from 10:00 a.m. to 10:00 p.m., and Sunday from 10:00 a.m. to 3:00 p.m. 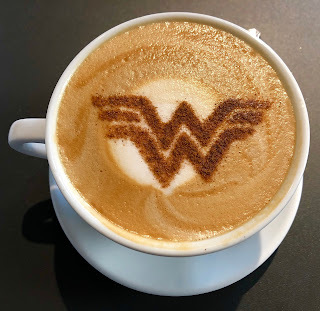 I don't read comics, and coffee has never been my beverage of choice. 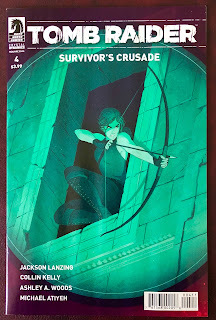 So why on earth did I make not one but two trips to Oblivion Comics & Coffee this past week? Well, I went for the toast! As I was scrolling through my Instagram feed last Sunday, I saw that someone (thanks, April!) had posted pictures of some yummy-looking vegan items from Oblivion. So I drove downtown Monday to see what they had. In addition to all the coffee drinks you would expect from a place with "coffee" in its name, they had a menu full of specialty toast items, almost all of which are or can be made vegan. They use bread from my favorite local bread baker, Grateful Bread, and instead of butter, they use Smart Balance Original buttery spread. Then they add other spreads and toppings. 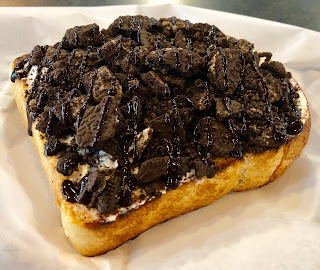 I couldn't resist the Winter Is Coming toast, consisting of French bread, buttery spread, cream cheese (yes, they have a vegan cream cheese option), crushed Oreo cookies, and chocolate syrup. Toast has never tasted so good! 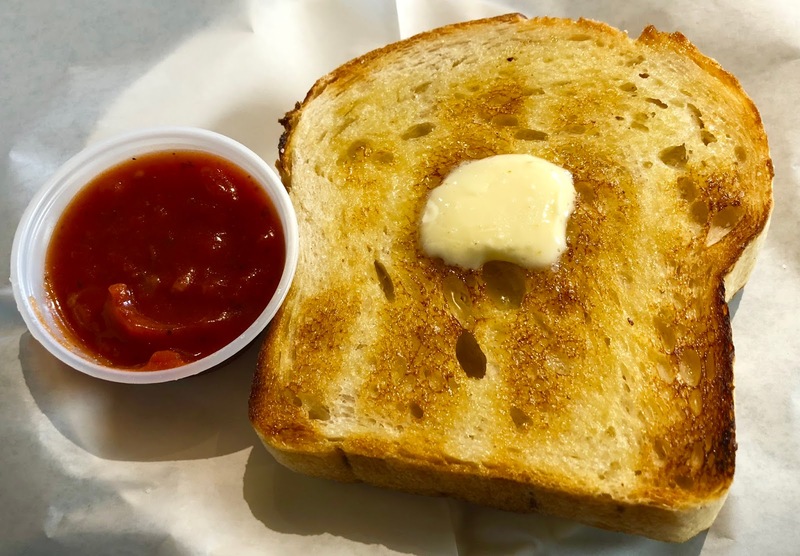 Other sweet toast options include cinnamon sugar, sprinkles, peanut butter with strawberry and blackberry preserves, and cream cheese with preserves. The only toast that can't be made vegan is the one that has Nutella on it. And if toast isn't your thing, they also carry a selection of Sugar Plum Vegan baked goods. I went back Friday, hoping to try the avocado toast, but they were out of avocado. My next choice was called (I believe) the Rip & Dip -- toasted sourdough with buttery spread, garlic salt, and a choice of hummus or marinara sauce for dipping. They were also out of hummus, so I ordered it with the marinara sauce. Very tasty! Even though I'm not a coffee drinker, I thought I should get a coffee so I could include the picture in this post. I ordered a latte with almond milk (they also have soy milk, both for an extra charge). I thought the Wonder Woman logo on top was a nice touch. And I even bought a comic book! Oblivion Comics & Coffee is located at 1020 11th Street, Suite 100, and their phone number is 916-329-8839. Their website address is http://oblivioncomics.com/, and their Facebook page can be found at https://www.facebook.com/oblivioncomics/. 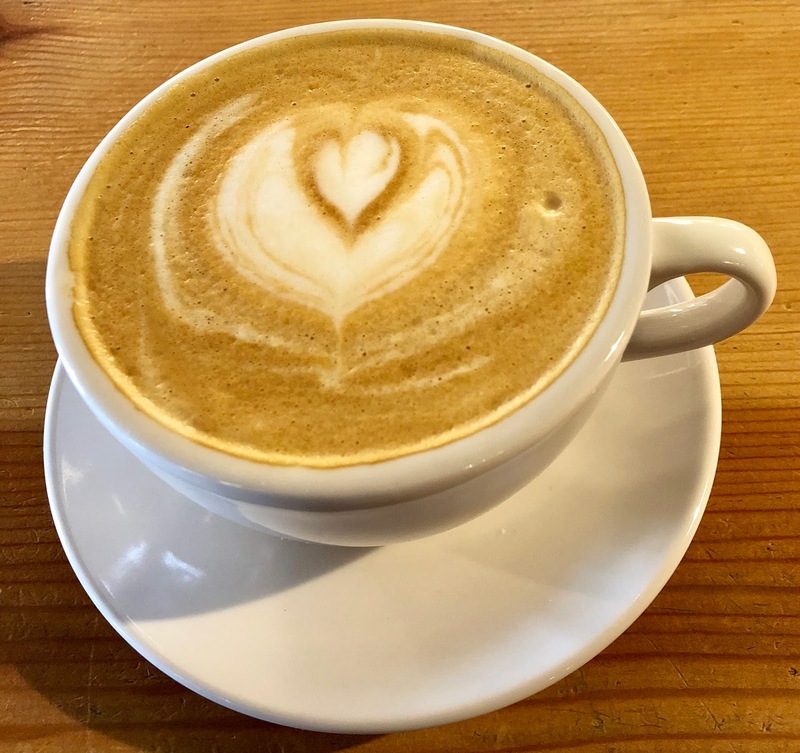 The café part of the store is open Sunday through Thursday from 8:00 a.m. to 7:00 p.m., and Friday and Saturday from 8:00 a.m. to 9:00 p.m.
Camellia Coffee Roasters opened recently in the space at the WAL Public Market on R Street formerly occupied by Metro Kitchen + Drinkery. I'm not much of a coffee drinker, but I had heard they might have vegan options, so I drove over on the weekend to check it out. There were three vegan muffins in the glass case at the counter, as well as a few non-vegan pastries. I wasn't really in the mood for a muffin, so I asked if they had any other vegan menu items. I was told they could make me a coconut yogurt parfait, which sounded perfect. 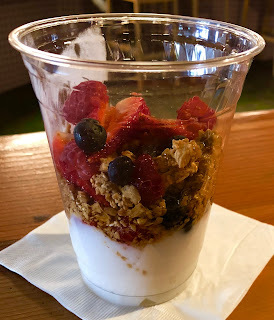 In addition to the coconut yogurt, it had granola, agave, and mixed berries. It was an excellent mid-morning treat. I also ordered a latte with coconut milk. Their other non-dairy milk option is almond milk. There is an extra cost for the non-dairy milks. Camellia Coffee Roasters is located at 1104 R Street. I was unable to find a phone number for them, but their website address is https://camelliacoffeeroasters.com/ and their Facebook page can be found at https://www.facebook.com/camelliacoffeeroasters/. They are open daily from 7:00 a.m. to 7:00 p.m.
My husband Phil and I celebrated our anniversary this past week by having dinner at one of the hottest new restaurants in town, Canon. This East Sacramento eatery has been popular since the day it opened, so I made sure to get a reservation a couple of weeks ahead of time. The dinner menu, which changes seasonally, currently has four vegan small plates. I chose three of them to try. 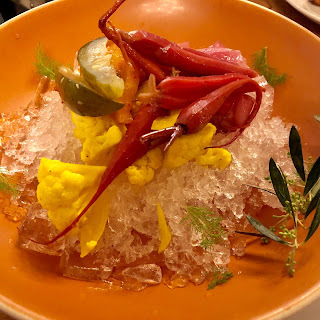 The first was the pickled vegetable plate, consisting of house-pickled cauliflower, carrots, cucumbers, and onions. They were served on a bed of crushed ice, which I thought was a nice touch. This dish looked much prettier when it arrived at the table, but I started to serve myself before I took the picture, and then had to try to put everything back where it was. Next, I had the citrus salad, which was my favorite dish of the three. 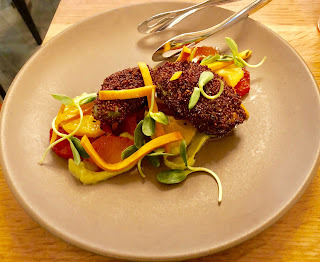 It had orange and grapefruit slices, thin strips of sweet potato, and generous portions of avocado, which were coated in red quinoa and then fried. The salad was dressed with a green curry emulsion. 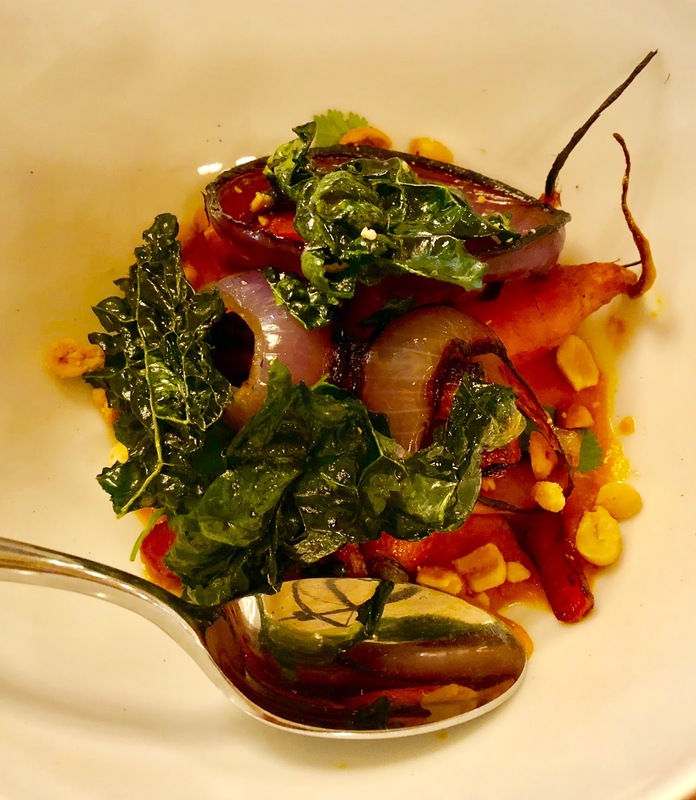 My last dish was the roasted carrots, which were served in a West African peanut sauce with crispy kale, onions, cilantro, and peanuts. I liked the creamy peanut sauce, which really enhanced the flavor of the carrots. Canon is located at 1719 34th Street, and their phone number is 916-469-2433. Their website address is https://canoneastsac.com/, and their Facebook page can be found at https://www.facebook.com/canoneastsac/. Canon is open for dinner Tuesday through Thursday from 4:00 p.m. to 10:00 p.m., Friday from 4:00 p.m. to midnight, and Saturday from 5:30 p.m. to midnight. They are also open for brunch Saturday and Sunday from 10:00 a.m. to 2:00 p.m., but their brunch menu doesn't list any vegan options. I just returned from a short vacation in Panama, which is why it's been awhile since my last post. One of the first things I wanted to do when I got back to town was to try Mas Taco Bar on R Street, which opened a couple of weeks ago. So I headed over there for lunch today. Mas Taco Bar offers both tacos and bowls, and there are two types of each that are vegan. I decided to try a little bit of both. 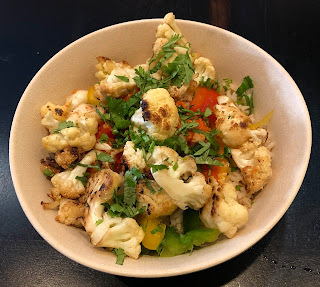 I ordered the butternut squash taco, topped with braised Swiss chard and pepito salsa verde, and the roasted cauliflower bowl, consisting of roasted cauliflower, romesco sauce, cilantro, and bell pepper over brown rice. Both were very good, especially with a little Cholula jalapeño and poblano hot sauce sprinkled over the top, but I liked the taco best. 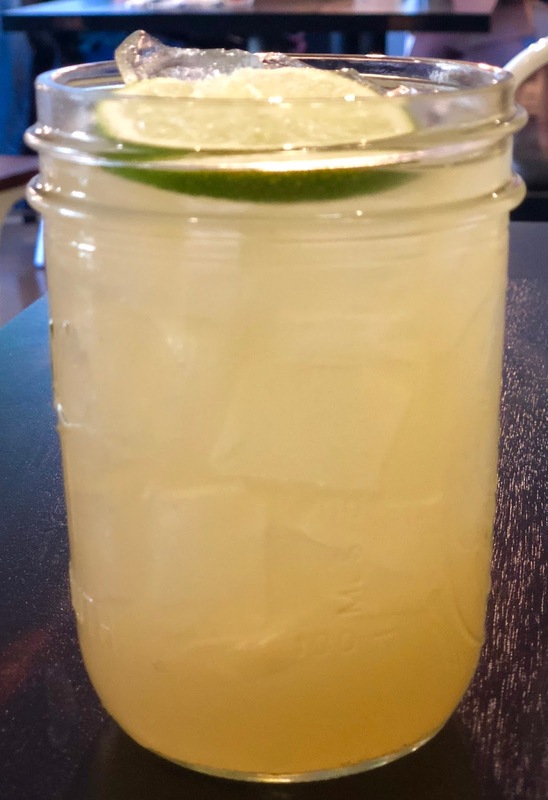 Mas Taco Bar also has some interesting mocktails on their drink menu. I was torn between the Berry Tasty (fresh strawberry, raspberry, pineapple, and ginger ale) and the Virgin Mas'garita (fresh lime, agave, and soda). I opted for the Virgin Mas'garita and loved it. I thought it had exactly the right amount of lip-puckering sourness. Mas Taco Bar is located at 1800 15th Street, in the space formerly occupied by Dos Coyotes, and their phone number is 916-706-1330. The restaurant's website address is https://mastacobar.com/, and their Facebook page can be found at https://www.facebook.com/mastacobar/. Mas Taco Bar is open Monday through Wednesday from 11:00 a.m. to 11:00 p.m., Thursday from 11:00 a.m. to midnight, Friday from 11:00 a.m. to 2:00 a.m., Saturday from 9:00 a.m. to 2:00 a.m., and Sunday from 9:00 a.m. to 11:00 p.m.